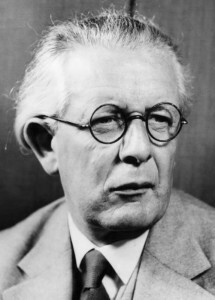 Swiss child psychologist Jean Piaget distinguishes the language and thought processes of children from adults as he develops an influential theory of child development. The adult, even in his most personal and private occupation, even when he is engaged on an enquiry which is incomprehensible to his fellow-beings, thinks socially, has continually in his mind’s eye his collaborators or opponents, actual or eventual, at any rate members of his own profession to whom sooner or later he will announce the result of his labours. This mental picture pursues him throughout his task. The task itself henceforth socialized at almost every stage of its development. Invention eludes this process, but the need for checking and demonstrating calls into being an inner speech addressed throughout to a hypothetical opponent, whom the imagination often pictures as one of flesh and blood. When, therefore, the adult is brought face to face with his fellow-beings, what he announces to them is something already socially elaborated and therefore roughly adapted to his audience, i.e., it is comprehensible. Indeed, the further a man has advanced in his own line of thought, the better able is he to see things from the point of view of others and to make himself understood by them. Ego-centric thought and intelligence therefore represent two different forms of reasoning, and we may even say, without paradox, two different logics. By logic is meant here the sum of the habits which the mind adopts in the general conduct of its operations–in the general conduct of a game of chess, in contrast, as Poincare says, to the special rules which govern each separate proposition, each particular move in the game. Ego-centric logic and communicable logic will therefore differ less in their conclusions (except with the child where ego-centric logic often functions) than in the way they work.